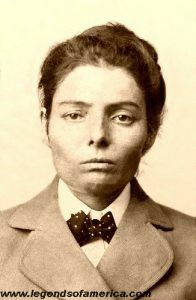 Laura Bullion, aka: Della Rose, Rose of the Wild Bunch (1876?-1961) – Bullion was a “member” Butch Cassidy’s Wild Bunch. Having taken part in several train robberies with the Wild Bunch, Kilpatrick and Bullion returned to Texas with William Carver, where Carver was ambushed and killed by lawmen on April 1, 1901. Bullion and Kilpatrick then fled to St. Louis, Missouri, where they were arrested on November 8, 1901. Kilpatrick was found guilty of robbery and sentenced to 15 years in prison, while Laura was sentenced to five. After serving 3 1/2 years, Laura was released from the Missouri State Penitentiary at Jefferson City, Missouri, on September 19, 1905 and lived the last years of her life in Memphis, Tennessee, under the name of Freda Lincoln, making her way as a seamstress and a dressmaker. She passed away on December 2, 1961 and is buried in Memphis under a tombstone that reads, “Freda Bullion Lincoln—Laura Bullion—The Thorny Rose.” She never saw her lover Ben Kilpatrick again. Kilpatrick, on the other hand, was released from prison in June, 1911 and immediately returned to a life of crime. While trying to rob a Southern Pacific express near Sanderson, Texas, on March 13, 1912, he was killed with an ice mallet.